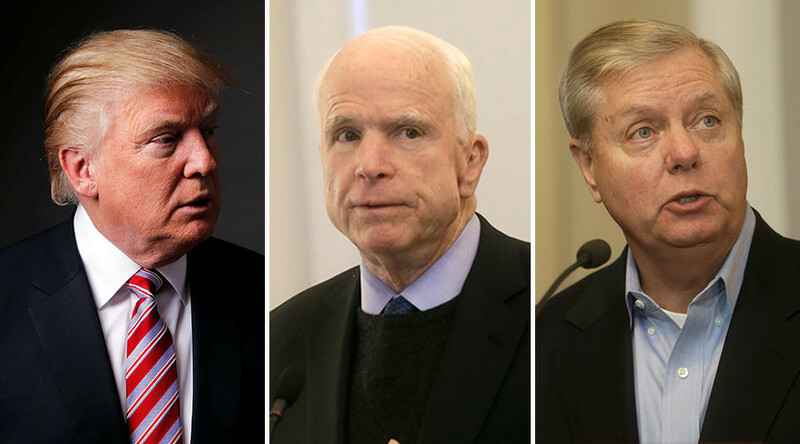 Trump has accused Republican Senators John McCain and Lindsey Graham as becoming warmongers. “Ultimately, we fear this executive order will become a self-inflicted wound in the fight against terrorism. At this very moment, American troops are fighting side-by-side with our Iraqi partners to defeat ISIL. But this executive order bans Iraqi pilots from coming to military bases in Arizona to fight our common enemies. Our most important allies in the fight against ISIL are the vast majority of Muslims who reject its apocalyptic ideology of hatred. Taking to Facebook also, Trump released a statement of rebuke, relating his actions to those of Obama in 2011 “when he banned visas for refugees from Iraq for six months,” Trump says. Trump continues to defend his travel ban as the right decision, and shows no signs of reversing it. Meanwhile, Republicans are joining the McCain and Graham criticisms, hawkish at least, who are also staunch anti-Russian. Glenn Greenwald from The Intercept also acknowledged their agenda as one of promoting war rather than peaceful objectives. Both senators consider Russia a threat to national security and have also condemned Trump’s initiative to work alongside Russia in the ongoing fight in Syria. I know we’re all supposed to love McCain & Graham now but it is true that their policy desires would have started WW3 multiple times by now. As RT reports, Trump has failed to ban those countries directly proven to be responsible for the 9/11 attacks, such as Saudi Arabia, Egypt, and the United Arab Emirates – nations which Trump has personal ongoing business ventures with. Critics have noted Trump’s hypocrisy, as he has mentioned the 9/11 attacks as one reason to toughen up national security and the nation’s borders. This article (Trump Accuses Senator McCain and Graham as Warmongers Focused on WWIII) is a free and open source. You have permission to republish this article under a Creative Commons license with attribution to Aral Bereux and DNewsHQ. Next Executive Orders So Far, Lots More Memorandums – But What ARE They?